← “Learn from yesterday, live for today, hope for tomorrow. The important thing is to not stop questioning” – Albert Einstein. I used this phrase at the end of the summer term 2014, to highlight that our work as a school is always more effective in the long run when we work in consort. Currently we are mid-term, with a whole lot of work well under construction, and with no real reason to say more than that. Rather like a building mid construction, there will be stages such as ‘laying the foundation stone’ and ‘topping out’ though put simply, the building’s finished when it’s finished. We are midst stream with our plans for a new school campus at Claires Court Junior Boys. We have partners in our work, including our architects PRP, our project managers Synergy, and our current site investors Berkeley homes. IMSB have proposed a hospital development on some 8 acres of our land at Maidenhead Thicket, and if fulfilled will provide valuable financial help for our new school. At the time of writing, a local gossip site quotes a variety of opinions which suggest that we have failed planning permission and/or that the Hospital have pulled out. To set the record straight, we have continued to work in considerable detail on our new school designs for our expanded site at Ridgeway. The RBWM planning office have let us know that they cannot deal with our application any earlier than early spring next year. In the meantime, RBWM planning is working full pelt to establish its building and planning strategy for 2015 and beyond. It is required to build some 900 houses a year for the next 10 years, it has proposed bringing some green belt sites into consideration, including some of our property of Cannon Lane, and that consultation is due to end early December. In keeping our planning strategy options open at this stage, we give ourselves time to see how local and central government are going to confirm how further construction is to be brought on for Maidenhead, and we expect our final planning application to take this plan into account. In the meantime, we are completely committed to our current sites, and we continue to make investments on all three sites to maximise the educational provision for our pupils. In January 2015, it will become clearer how best we can realise our project to unite the school campuses. We will continue working on our new designs for teaching, learning, arts and sports for our new campus, and shortly into the new year, we will have completed those designs ready for making our planning application. 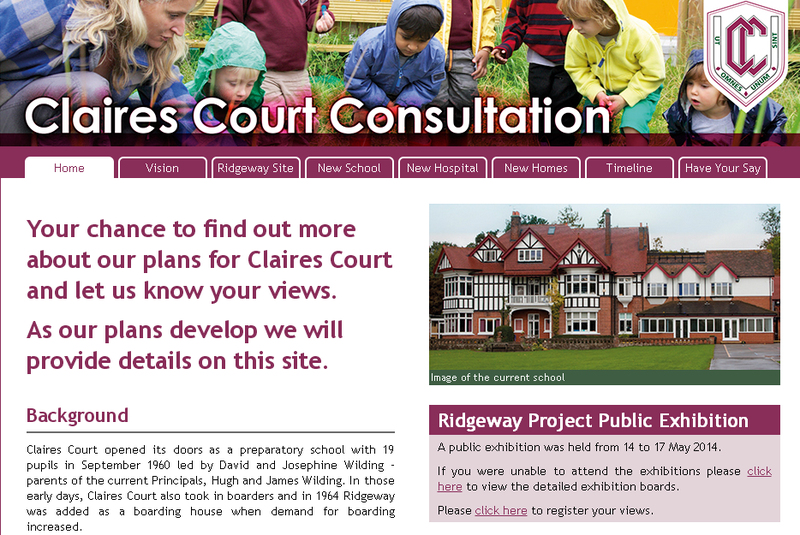 Watchers of our work will be able to trace change via our consultation site, http://www.clairescourt-consultation.co.uk/index.html, and via our on-going mailings from the school offices. The estimated opening of the new school continues to be September 2017, and remains achievable within our revised planning application schedule. Plans of this scale and importance take time and care to bring to fruition, and will continue to require good will from all of those we work with to ensure we achieve the very best for our school. Should the timescale slip, then the next date of opening will be September 2018. Whatever happens for the future, it also remains our clear priority to run the current school sites as effectively and efficiently as possible. We will maintain their fabric to the very high standards for which we are renowned. We’ll not only want to travel together in order that we can go far, but we’ll also not spoilt the ship for a hap’orth of tar! This entry was posted in Uncategorized and tagged Claires Court Junior Boys, planning application, planning strategy. Bookmark the permalink.